The parallel scenario process enables characterization of climate-related risks and response options to climate change under different socio-economic futures and development prospects. The process is based on representative concentration pathways, shared socio-economic pathways, and shared policy assumptions. Although this scenario architecture is a powerful tool for evaluating the intersection of climate and society at the regional and global level, more specific context is needed to explore and understand risks, drivers, and enablers of change at the national and local level. We discuss the need for a stronger recognition of such national-scale characteristics to make climate change scenarios more relevant at the national and local scale, and propose ways to enrich the scenario architecture with locally relevant details that enhance salience, legitimacy, and credibility for stakeholders. 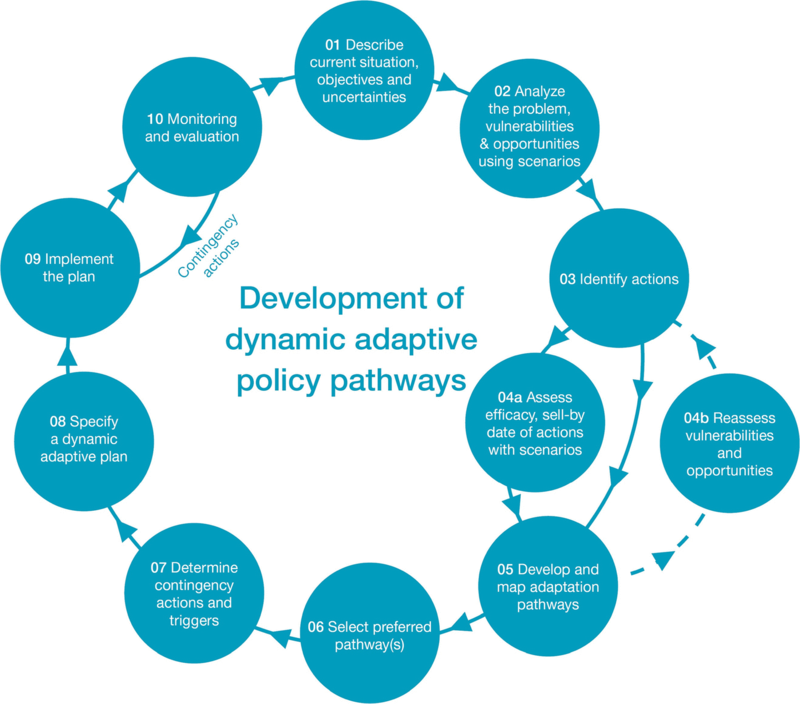 Dynamic adaptive pathways are introduced as useful tools to draw out which elements of a potentially infinite scenario space connect with decision-relevant aspects of particular climate-related and non-climate-related risks and response options. Reviewing adaptation pathways for New Zealand case studies, we demonstrate how this approach could bring the global-scale scenario architecture within reach of local-scale decision-making. Such a process would enhance the utility of scenarios for mapping climate-related risks and adaptation options at the local scale, involving appropriate stakeholder involvement. The parallel scenario process provides a robust scenario framework for exploring the drivers, consequences, and societal responses to climate change (Ebi et al. 2014; van Vuuren et al. 2014). It comprises representative concentration pathways (RCPs), shared socio-economic pathways (SSPs) for socio-economic trajectories (O’Neill et al. 2014, 2017), and shared policy assumptions (SPAs) that characterize dedicated climate policy responses under alternative futures (Kriegler et al. 2014). The scenarios provide a tool to explore deep uncertainty across scales and sectors (Moss et al. 2010; Rickards et al. 2014; Trutnevyte et al. 2016). The parallel scenario process has an important role in supporting decision-making for more resilient futures (Kok et al. 2006; Wilbanks and Ebi 2014; Absar and Preston 2015; Nilsson et al. 2017; Palazzo et al. 2017), but the application of SSPs in adaptation and vulnerability studies has mostly been at the global or broad regional scale (e.g., Arnell and Lloyd-Hughes 2014; Hasegawa et al. 2015; O’Neill et al. 2017). Their ability to support decision-making at the national and local scale remains largely untested. Examples that build on the SSP architecture and apply it at regional (Alfieri et al. 2015; Carey 2014; Palazzo et al. 2017), national (König et al. 2015; Steininger et al. 2016; Frame et al. 2018), or local (Absar and Preston 2015; Nilsson et al. 2017) scales are limited, and there is little evidence for the extent to which such SSP-based scenarios have informed real-world decisions. 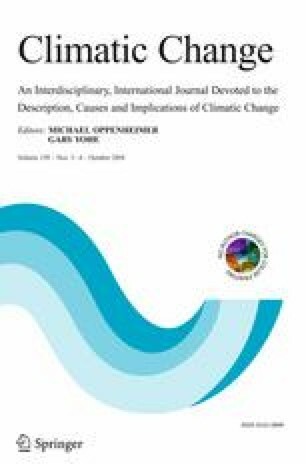 We propose that a key reason is that these scenarios fail to capture the local socio-economic drivers of climate-related risks and sensitivities of adaptation practice (Olwig 2012). In this essay, we examine how to use a dynamic adaptive pathways (DAP) process to achieve this goal through identification of key adaptation pathways, and illustrate this through case studies from New Zealand (NZ). When downscaling the focus from global to local scales, the artificial separation between SSPs (which do not include climate policies and are characterized only at global or broad regional scales) and the SPAs (which include only climate policies) becomes problematic when real-world actors seek to apply downscaled global scenarios to inform policies and strategies for complex national climate-related problems. This is particularly true at local scales, where the ability to effectively influence climate outcomes is much less than the ability to shape non-climate outcomes. Frame et al. (2018) argue that this can be addressed through SPAs that contain a mix of climate-specific and non-climate-specific policies. Central to this is the large number of variables that materialize at the local level when one attempts to consider all stakeholders’ concerns, and because socio-economic development at the local scale can enhance or counteract regional and global trends. For example, niche green production systems could emerge at the local scale even if the global narrative is one of a relentless focus on resource exploitation (Ortiz et al. 2017). Possible futures at the local scale therefore quickly multiply far beyond the diversity of futures captured by the global set of RCPs, SSPs, and global-scale SPAs. Dynamic adaptive pathways (DAP) is one approach that can be used to support decision-making under conditions of complexity and uncertainty (Haasnoot et al. 2013; Lawrence and Haasnoot 2017). Rather than being limited to identifying the best single set of adaptation options for a limited set of climate change scenarios, DAP enables decision-makers to consider a range of possible adaptation options, how they will be affected over time, and whether any options have a “sell-by date” (i.e., a point at which they are no longer viable). It also enables decision-makers to explore what combination of options (described as pathways) is most suitable for adapting to future climate change. It focuses on identifying, appraising, and sequencing options through a participatory process. Scenario-based pathways planning models, such as DAP, provide a structured approach for decision-making when dealing with complex systems and uncertainty. Instead of reacting to systems’ surprises on an ad hoc basis, the DAP process provides a decision-oriented framework for considering a full range of adaptation pathways for a particular setting (Haasnoot et al. 2013; Maier et al. 2016) from which the most critical pathways can be determined. We propose using DAPs as a process to highlight key adaptation pathways at the local scale, supported by engagement of stakeholders to ensure recognition of decision-salient non-climate features and triggers for decisions. To develop an adaptation pathway, Haasnoot et al. (2013) proposed a stepwise process (Fig. 1) to identify objectives and analyze the problem, and potential actions, across multiple futures using transient scenarios. Promising actions to reduce vulnerabilities and realize opportunities are then sequenced, and described. A monitoring system is used to evaluate the robustness of decisions and the related contingency actions to maintain the desired trajectory of an adaptation pathway. Pathways planning shifts the emphasis of climate change research away from assessments of vulnerability, impacts, and resilience, towards greater consideration of decision-making, and comparative evaluation of different policy and management options (Wise et al. 2014). Pathways planning emphasizes the process of decision-making, not just the outcome. The DAP process can be used to prioritize potential adaptation actions, and identify which alternatives matter most at the national and local scales. Such an approach is inherently flexible, accommodating changes over time in response to the developing future. It allows for acceptable trade-offs between complexity and comprehensiveness in national- to local-scale socio-economic scenarios. Dynamic adaptive pathways also rely on participation from stakeholders to identify potential adaptation actions (Barnett et al. 2014; Lawrence and Haasnoot 2017). When participants are involved in a planning process, they are more likely to support proposed actions and to lead or assist with implementation. Participation provides stakeholders with agency in the overall outcomes, and the process of deliberation about the desirability and feasibility of different pathways can help identify opportunities for change within the system. Most importantly, a participatory process ensures that salient non-climate features that influence climate-related risks and response options are identified and integrated into the scenario space. To illustrate this, three New Zealand (NZ) case studies are discussed to illustrate the non-climate dimensions needed to develop adaptation pathways. Given its small size, NZ science and policy communities have considerably more interaction than elsewhere, and the impacts and implications of climate change have been the focus of recent attention. The first case study is a stand-alone sectoral study (Cradock-Henry 2017). The next two are part of a larger series of local case studies of globally linked, socio-economic scenarios for NZ using the parallel scenario process (Frame and Reisinger 2016). Each section summarizes the issue, provides context, and identifies non-climate elements, although in this paper we do not evaluate the particular adaptation pathways. New Zealand’s sensitivity to climate change impacts and their implications is largely a function of its dependence on primary economic activities such as agriculture and horticulture. Kiwifruit is an expanding industry, with over 90% of production exported and revenues accounting for 2.4% of exports in 2016. Kiwifruit growers are exposed and sensitive to a complex array of interacting climatic and non-climatic stressors, and their vulnerability is clearly a function of exposure and sensitivity to climatic conditions (Cradock-Henry 2017). Multiple linkages to markets and social license to operate are particularly salient. Combinations of temperature and precipitation, climate variability, and weather extremes affect yield as well as quality. Kiwifruit vines are especially sensitive to changes in temperature, and growers seek to compensate for warmer winter temperatures by spraying vines with Hi-Cane, a highly toxic plant growth regulator that can cause health issues. In some areas, production is only possible using Hi-Cane, as winter temperatures are already too warm. This is likely to lead to decline in the area suitable for horticultural production and increased use of Hi-Cane (Kenny 2011). Hi-Cane has become a politicized community issue due to public health and environmental concerns, and it has been banned by the European Union (EU) for use by growers there. To market NZ kiwifruit in Europe, growers must meet EU standards for good agricultural practices in order to gain access to European supermarkets. Many growers identified the potential loss of Hi-Cane as a significant future risk, constraining their ability to successfully adapt. Hence, the use of Hi-Cane should be treated as a non-climate policy assumption that has different implications under different SSPs. Articulating and accounting for the potential and interacting decisions, attitudes, and perceptions of multiple actors in national-scale SPAs relating to trade and environmental regulations is critical if the kiwifruit industry is to use the RCP/SSP/SPA scenario architecture to evaluate risks and response options to climate change. Characterizing the complexity of these influences at the local level can also enhance the legitimacy of adaptation pathways through greater transparency, compromise, and balance between the national- and global-scale drivers of change, and the actors’ more immediate local concerns. NZ has relatively high levels of native biodiversity and endemic species. Since European settlement, non-native species have been deliberately or inadvertently introduced, and these pose one of the most serious threats to vulnerable native fauna. Climate change will influence vegetation dynamics, species distributions, hydrology, and pest dynamics in novel ways that threaten the resilience of alpine-forested ecosystems. In forested ecosystems, the risk of predation by exotic mammals is increased significantly following high seed fall (“mast”) years, which fuel pest irruptions. The irregular seeding of millions of hectares of beech trees that occurs once every 10 to 15 years, resulting in an explosion of mice and rat numbers, is driven by changes in temperature and specific weather events. social license for pest control measures. While the first three can be modeled successfully, based on suitably downscaled RCPs and appropriate biophysical and ecosystem models, social license is critically dependent on the future shape and values of society and cannot be simply downscaled from global-scale SSPs and SPAs. Near-coastal lowland regions in eastern NZ face rising sea levels, increased coastal erosion, and changes in riverine flood frequency and intensity. Drought risk, combined with increased severe weather events resulting in flooding, is expected to increase with warmer temperatures and a rise in the number of hot, dry days (Reisinger et al. 2014). The effects of these dynamic climate-related risks will be compounded by changes in land-use suitability and concomitant increases in invasive weeds and pests. Areas currently under production may become marginal for certain types of primary production, while previously unsuitable areas may open up (Ausseil et al. 2017). Our interpretation of the results identifies two adaptation pathways in addition to climate change: the economic market drivers of land-use change, and social license for techniques to manage pests and disease. Land managers’ and other actors’ agency in this setting relates to responding to commodity price signals to realize new land uses or change existing ones. Low-lying land, for example, much of which is currently in dairying, is likely to flood more frequently, and will also be affected by changes in pasture production. Despite a net positive gain in total annual pasture production, the seasonal feed gap from losses in summer could be significant at the farm level, necessitating changes in management practices, including reduced stocking rates, shifting the period of peak milk production, or adding additional storage capacity. Farmers may also need to adopt new hybrid varietals or shift sowing dates, or change land use entirely. Although economic modeling suggests an increase in log prices in the future, without considering land managers’ agency—and motivations—it is not clear that increased afforestation is inevitable. Similarly, increased profitability for sheep and beef farming may or may not result in a shift back to those land uses from dairy. Warmer temperatures will also increase the optimal areas for invasive weed species, fruit fly pests, and damaging pathogens. Costs of production, therefore, may generally increase due to the need for increased environmental management for pest control, and the decisions (and trade-offs) land managers may need to consider. The parallel scenario process can support decision-making for climate-resilient futures at a local level if it engages stakeholders with both climate issues and other drivers of change. In so doing, however, stakeholders need to be empowered through explicit exploration of both climate policies and non-climate policies that mediate climate outcomes. Our reading suggests that this can be achieved using a DAP process that identifies critical non-climate features that matter for local-scale risk perceptions and decision-making. Adaptation pathways can be examined across different SSPs and national SPAs to consider the decision implications of different socio-economic futures and policy drivers, especially where domestic choices result in countries supporting global trends or responding counter to them. Shifts to or from intensive emissions pathways, increased trade protectionism, or more globalization, for example, will have flow-on effects for adaptation decisions, which can be considered in a detailed, structured manner. While adaptation pathways are tacitly understood and accounted for at the global level through their inclusion in models, they must be explicitly identified and elaborated qualitatively and quantitatively at the local level to account for complexity and context specificity. In so doing, the process of identifying adaptation pathways can provide a salient, legitimate, and credible tool that supports making decisions under conditions of uncertainty and helping to deliver resilient climate futures. In conclusion, we contend that the parallel process architecture can best be extended through SPAs at the national level that capture key climate and non-climate development paths that have a material bearing on locally experienced risks from climate change and response options. The critical elements that national- and local-scale scenarios need to address can be uncovered through a DAP process, resulting in identification of the most critical adaptation pathways for local understanding of climate change risks and response options. Linking stakeholders’ perceptions and understanding of local system dynamics with robust scientific knowledge can deliver credible, salient, and legitimate knowledge for action. As more local climate change scenarios are published, the utility of DAP for decision-making at a local scale can be further assessed. This paper was produced as part of the New Zealand Ministry of Business, Innovation and Employment’s Catalyst project Catalysing Climate Change Scenarios for Local Relevance (Contract C09X1516).